To avoid unnecessary questions, please READ the entire description! Click [full description] below, if the description is not expanded. Featuring a cute little baby elephant in a crib in it's nursery in shades of brown, green, beige, and tan. 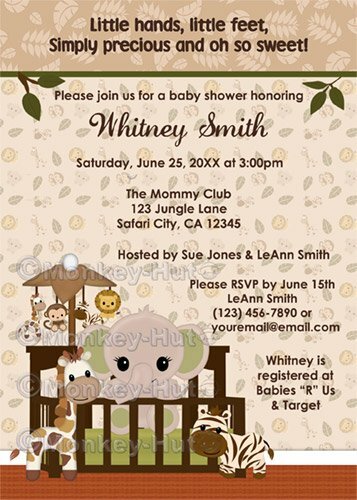 Coordinates with any jungle/safari elephant baby nursery theme. Giraffe, zebra, lion, and monkey. (2) Your own wording OR as shown in the invite. (11) CHANGES if any - (colors, wording, fonts,etc.) Unless specified, invitation will follow the same format as sample shown including wording/bolding. You may also send a separate email with the above to monkeyhutdesigns@gmail.com, but please be sure to include your order#. I do get quite a lot of email, so I prefer this info be included on your actual order form, so as not to miss it. 2. You will receive a proof within 1-3 BUSINESS days (not including holidays and weekends). Please ensure to get all needed information to me ASAP. Processing of your invitation does not begin until cleared payment & all info has been received. VERY IMPORTANT NOTE: If it has been longer than 3 business days and you still have not received your proof, please check your SPAM/JUNK folder. Hotmail accounts, as well as schools/government organizations, tend to put my email in SPAM or block them completely. Please make sure I can communicate with you by ensuring monkeyhutdesigns@gmail.com is an approved email sender in your filters. If your email provider is one of the above, please provide a secondary email address NOT through those providers. 3. Once you are happy with your PROOF/DRAFT, I will email you the FINAL version in a high-resolution 300 dpi jpg/JPEG file, which you may either print at home or upload to a photo lab of your choice (i.e. Walmart, Walgreen’s, Target, CVS Pharmacy, Costco**, Sam's Club, etc. or even online places like Snapfish, Winkflash**, Shutterfly and KodakGallery.) You can even use 1-hour services. You can have high quality invitations printed inexpensively & quickly. Simply treat your invitation jpg file just like a digital photo file. If you've ever had your digital photos printed, that's exactly what you do with your invitation file. I also offer several of my designs on Zazzle, where they are printed on your choice of 6 different kinds of high quality paper/card stock and each invitation comes with an envelope. The ©Monkey-Hut copyright watermarks across the previews are for image protection and will NOT appear on the actual item you will receive. Copyright: ©All artwork, products, and images are ©2000-2012 Connie Girga (aka Monkey-Hut). Artist retains copyright and artwork images are NOT to be reproduced in any way. All rights reserved.